Fire. It’s a vital component of any overlanding journey. 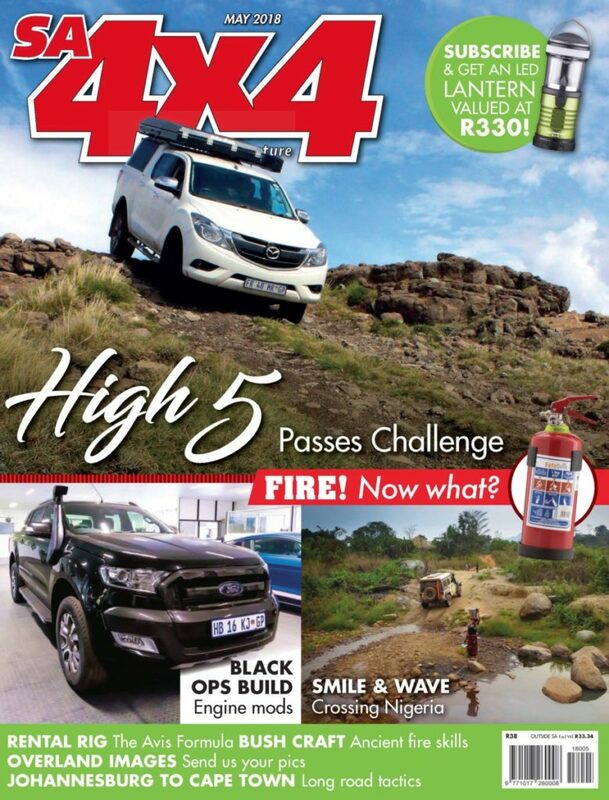 Internal combustion powers your 4×4; and more often than not, fire cooks your meals out in the wilderness. On the other hand, fire can be the cause of your journey’s untimely end. Unfortunately, while we are all too eager to stock up on gas bottles, jerry cans and firewood, we often overlook the absolute necessity of having fire extinguishers. Fire extinguishers are not too expensive to purchase and are widely available in many retail outlets. It is also simple enough to mount a fire extinguisher in your cab, or to stash it alongside your recovery equipment. However, there are a few factors you’ll need to consider first, and we’ve listed these below. 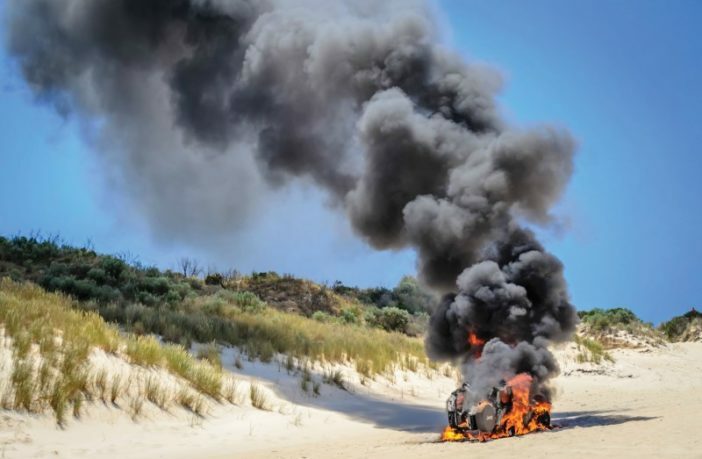 There are several causes; and in each case, you need to put out any fire as soon as possible to avoid terminal vehicle damage and any threat to life. Overheating and fuel leaks are a core cause, as are electrical shorts. Fires in tents and around campsites are not that uncommon, either. Be prepared. When overlanding, there is another present danger. While travelling through areas of long grass like the Marienfluss, or even a dry, grassy field on your neighbour’s farm, disaster can strike when seeds and strands of dry plant material get caught underneath your car. Heat from the exhaust can ignite this material, which will burn upwards, engulfing the vehicle in short order. It is a good idea to stop every half hour to check, and to clear out any debris build-up with a ready-to-hand piece of wire with a hook on the end. Rubbing between Jerry cans carrying fuel is a source of static electricity, right next to a flammable substance. Put rubber inner-tube chafing stops between cans to prevent this. Another scenario involves electrical shorts from dual-battery systems and poorly-installed electronics in vehicles and trailers. The same goes with gas lines from your LPG bottles – make sure there are no leaks. Above all, don’t take chances. Smoking while refuelling, for example, is asking for trouble. Never mind how fires start – this is how they can end! Fire is defined by what feeds it, and, in the case of a vehicle, that could be several things. Class A: Fires involving paper, wood, textiles and plastics. Class B: Fires involving flammable liquids like fuel, cooking oils, kerosene. 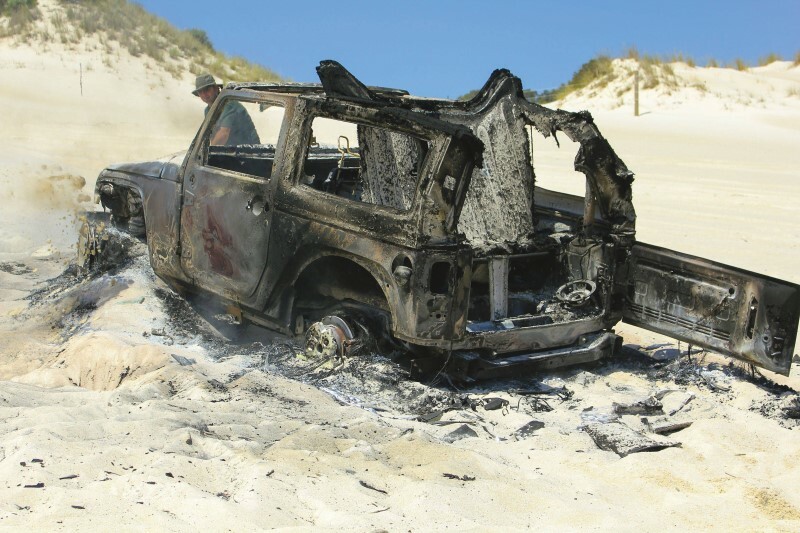 Class C: Fires involving live electrical equipment, which is found all over your car. These three basic fire types are generally dealt with differently, and with different substances. NEVER purchase a fire extinguisher that isn’t marked with ratings. Note that the Class number is followed by a numeral – this is linked to the capacity of the extinguisher. The higher the number, the greater the capacity. To be on the safe side, always go straight to a unit from an SABS-approved manufacturer. 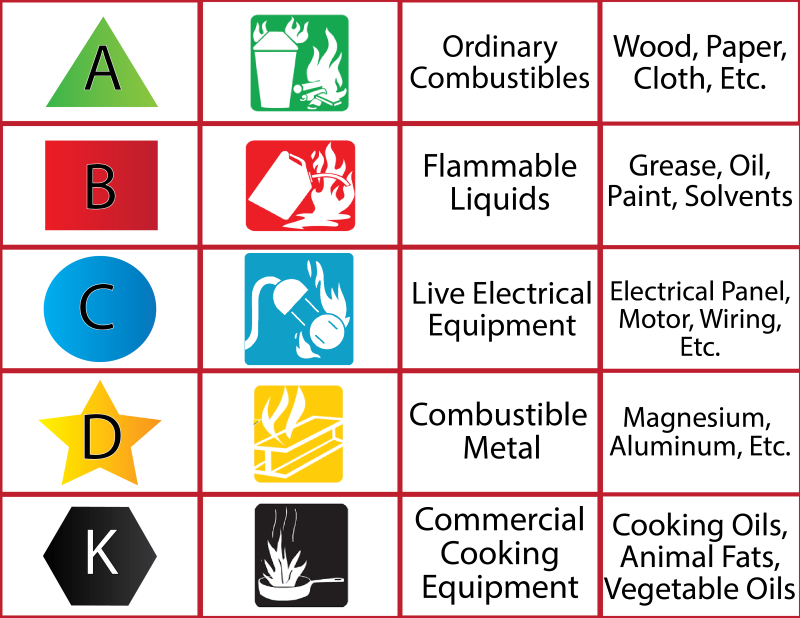 Generally, fire extinguishers are marked with a combination of A, B and/or C, to denote what type of fire they’re effective against. All work on the same principle: changing the reaction between heat, fuel and oxygen. Class A fires are usually put out using water, carbon dioxide (these units have a funnel-type nozzle to direct gas flow), or dry chemical agents like monoammonium phosphate and sodium bicarbonate, which smother fires and starve them of oxygen. The same principle works with Class B fires, but a special material called Purple K actually causes a chemical reaction that can kill this type of blaze. Finally, Class C fires can also be put out with monoammonium phosphate (abbreviated as MAP) or sodium bicarbonate, because they’re not conductive. Which type of extinguisher should I have in my vehicle? Remember to attack the fire from the unburned side, protecting what hasn’t yet been damaged. Once the fire is out, remove as much of the powder as possible, limiting corrosion. Avoid hosing down damaged electrical components! A vehicle fire can involve all three classes of fire mentioned above, so you’d need an all-round Class C extinguisher that won’t cause too much damage. Kim Botha, of CENTA Group, a local fire safety manufacturer, recommends powder extinguishers which work with a mixture of phosphates and ammonia, known as MAP. Silicate kaolin is added to prevent the powder from going hard during storage, and ammonia sulphate is added to ensure that the MAP itself cannot burn. Cheaper extinguishers contain less ammonia sulphate – as with most things, you get what you pay for. Unfortunately, dry powders can be corrosive and caustic, so if they are allowed to stay on metals after a fire is extinguished, they will cause damage. The material should be hosed off as soon as the fire is out. How big does the extinguisher need to be? You probably don’t have much space for a fire extinguisher, but that doesn’t mean you should go for the smallest one. The minimum size for all passenger vehicles (and for caravans and boats) should be a 1.0 to 1.5kg Class C MAP type of extinguisher. Fire extinguishers contain limited material, so they need to be recharged immediately after use. Even minimal discharge can lead to leakage, so don’t test it to see if it’s charged. Good units have accurate gauges on them. If the needle is in the green, you’re probably good to go! The law in South Africa states that fire extinguishers must be serviced annually by a registered SAQCC 1474 technician working for a listed SABS company. Keep your powder extinguisher in working order! Powder can settle over time, even with the aid of silicate kaolin. Every now and then, give your extinguisher a flip, and a firm (but not damaging) bash against a hard surface to loosen the particles inside. Do this regularly, or you might be caught off-guard with a useless extinguisher. Also, note that most fire extinguishers usually don’t work upside down. The propellant sits on top of the powder, and is fed to the base of the extinguisher via an internal down-pipe. When operated upside down, only propellant emerges. Consider buying a hose extension for the nozzle, to help you get underneath your vehicle. Which types of fire extinguisher should I avoid? Any extinguisher worth buying will have fire ratings printed on the tank. Extinguishers that don’t cover either Class A, B or C should be avoided, because they may not be effective on all parts of your car. Naturally, D and F extinguishers are for other types of fire, and are not designed for your car. Finally, avoid water or foam-based products, as they are conductive and will cause damage to the electrical systems of your car. Where should I store my fire extinguisher? It’s vitally important that your extinguisher is easily accessible, usually in the passenger footwell or on the transmission tunnel, as a few seconds can make the difference between life and death. There are several fire extinguisher mounts out there, but you should opt for quick-release products that can be attached to any part of the car. The mount should also be robust enough to handle sudden stops as well as the shakes and bumps associated with gravel travel. Also remember that your trailer or caravan needs its own unit.